This week again, we can see a wide range of products from the beauty category on a Walgreens Ad. The prices are valid on Sep 16 - 22. 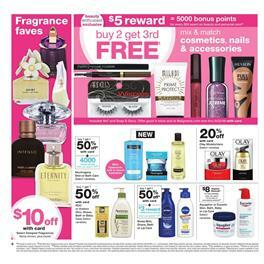 Earn $5 Reward for the $50 purchase of beauty and personal care products that are on pg 7. Many brands are included in that sale. BOGO 50% off Neutrogena skin or bath care. That's an important deal for skin care since we are in a change of seasons. Whenever it's changing you have to be careful not to harm your skin. Irritation is harmful when it's getting colder by the Autumn. The fragrance will be $10 off at WalG. Also, rewards, coupon savings and mix and match sale are available in this category. Visit pg 7-8 where products like Gillette razor systems are on sale, too. Follow the Facebook page for more products, deals and future Walgreens Weekly Ads.